For details please consult documentation. please open the next tab Listeners and unselect "Use default reporters" checkbox. This option was not available in testng 5.0 which you use. You may configure this setting also for project default configuration so all new configurations would get the correct value. SOLVED: I removed the testng5-0.jar and the testng plugin worked with no further configuration. You seem to be using TestNG 5.0? This is a very old version, update to the latest (6.8.5) and try again. Update: sorry for the late response, which Anna has answered. I posted it two days ago but I didn't see that the forum rejected my post, and I can't seem to be able to delete it now. Anna, can you let us know how you deleted the jar (location)? Cedric, how do I update the testng plugin to the latest version? 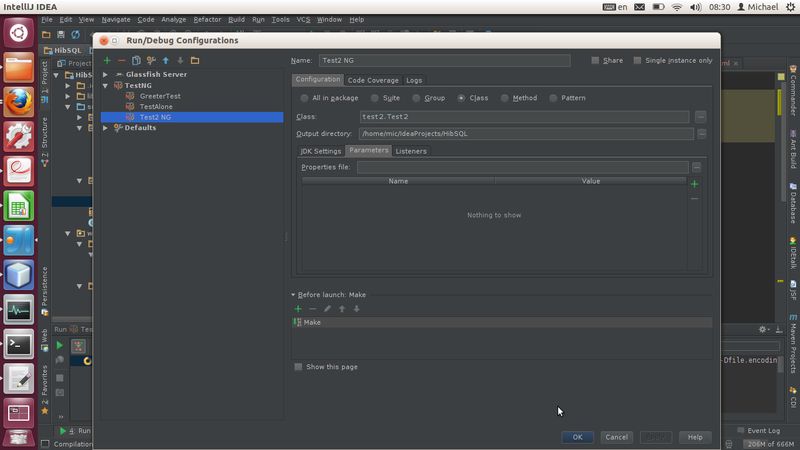 When I goto plugins options in IntelliJ preferences, all i see is the TestNG plugin listed as "bundled". it's located in IDEA_INSTALLATION_HOME/plugins/testng/lib. One jar there is IDEA's plugin jar and another one is testng.jar which you have to replace with your own downloaded from testng.org as jar from maven doesn't have ability to actually start tests. I have updated the TestNG jar to 6.8.7 in teh plugins folder and still i am getting the same error. here is the complete output from console. Testng.jar showing in plugins folder has been renamed. It is actually 6.8.7 version. Please remove testng 5.0 dependency from your project. Thanks Anna. After removing testng 5 from classpath, it started working.